The 31-year-old was driving a white Mercedes SUV along Wilshire Boulevard in Los Angeles on Friday (10Mar17) when a Volvo SUV crashed into the passenger side of her vehicle as she was making a left turn. 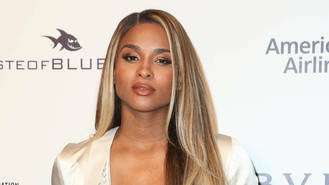 Heavily pregnant Ciara was seen walking around after the incident, talking on a phone while nursing what appeared to be an injured chest and shoulder, eyewitnesses told TMZ. The singer took to Twitter following the terrifying incident, and touchingly thanked her body for keeping her baby safe during the drama. "Thankful For Gods Grace, and Amniotic Fluid," she wrote on Friday. A rep for the Goodies hitmaker told Entertainment Tonight that Ciara and her unborn baby are doing well. "The driver was illegally in the bus lane and hit the right side of her car," the rep added. The incident was reported at 11.48am (EST) on Friday, and the Los Angeles Fire Department confirmed they had one engine on the scene, and nobody was transported to hospital. An on-duty police officer from the West L.A. Traffic Division said the crash was "just property damage only." Ciara's husband Russell Wilson reportedly rushed to the scene of the incident on Friday to comfort his wife, and later wrote an update on Twitter. "Momma Wilson & Baby Wilson are feeling great! God is good!" he posted, alongside praying hands and angel emojis. The singer is due to give birth to her and Russell's first child in the Spring (17). Ciara also shares a two-year-old son, Future Zahir, with her ex, rapper Future.